* RSR Interviews Illustra Media's Science Film Producer: Real Science Radio host Bob Enyart welcomes back Lad Allen of Illustra Media to discuss his latest film, ORIGIN: Design, Chance and the First Life on Earth. Featuring scientists Paul Nelson and Ann Gauger (and narration by Alvin Chea of Take Six), ORIGIN presents spectacular computer animation and cutting-edge research to examine the question that has baffled science: How did life on Earth begin? Today, most researchers insist it arose through simple chemistry that—without direction or plan—transformed inanimate matter into the first living cell. Yet, this explanation is devoid of evidence and unsatisfying, even to many of its most ardent supporters. 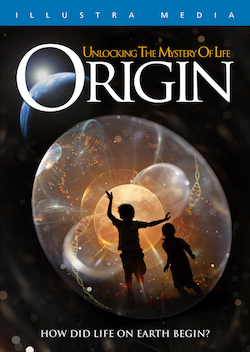 As ORIGIN exposes the flaws of materialistic theories, you’ll travel through a molecular universe to encounter extraordinary biological engineering fundamental to the survival of every organism that has ever existed, engineering that points clearly to intelligence and mind. RSR recommends: Buy ORIGIN now, at Amazon.com on DVD or Blu-ray! * For the First Monday that Donald Trump Woke Up in the White House: (post-show update) See the full-page Washington Times ad run by Colorado Right To Life to urge the Congress, the Supreme Court, and the new Trump administration, to learn what is right and to do what is right, by the most innocent among us.